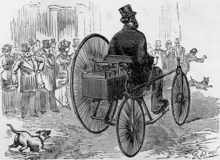 In 1880 Trouvé improved the efficiency of a small electric motor developed by Siemens and using the recently developed rechargeable battery, fitted it to an English James Starley tricycle, so inventing the world’s first electric vehicle. Although this was successfully tested on April 19, 1881 along the Rue Valois in central Paris, he was unable to patent it. Trouvé swiftly adapted his battery-powered motor to marine propulsion; to make it easy to carry his marine conversion to and from his workshop to the nearby River Seine, Trouvé made it portable and removable from the boat, thus inventing the outboard engine. On May 26, 1881, the 5m Trouvé prototype, called Le Téléphone reached a speed of 1 m/s (3,6 km/h) going upstream at 2.5 m/s (9 km/h) downstream. Gustave Trouvé next invented his "Photophore", or battery-powered frontal headlamp, which he developed for a client, Dr Paul Hélot, an ear-nose-and throat specialist of Rouen. This wearable, direct shaft, lighting system could be oriented by head movements, so freeing the hands of its wearer. A file of correspondence between these two men enables one to place this invention during 1883. Trouvé soon modified their frontal headlamp both for use by miners, rescue workers, and later by speleologists, in dark surroundings, but also by tinting the light with various colors as theater jewelry for artiste troupes in Paris and Europe. The latter became known as "luminous electric jewels" and was the forerunner of today's wearable technology. In 1884, Trouvé fitted an electric boat with both electric horn and a bow-mounted frontal headlamp, the first time such electrical accessories had ever been fitted on any mode of transport. He developed a portable electric safety lamp. In 1887, Trouvé, whose brand name was Eureka (Greek: εὕρηκα =“I have found”, translated into French “J’ai trouvé), developed his auxanoscope, an electric slide projector for itinerant teachers (1887). Around the same period, Trouvé, a confirmed bachelor uninterested in commercialization, turned his fertile mind skywards. Convinced that the future lay with heavier-the-air machines, he flew a tethered model electric helicopter, the ancestor of the Sikorsky Firefly. When the obligatory concession for his tomb in the cemetery of his native town of Descartes was not renewed, Trouvé’s remains were thrown into the common grave. His archives were destroyed in February 1980 during an accidental fire in the Town Hall. In 2012, following a French biography by English transport historian Kevin Desmond, a commemorative plaque was officially unveiled on the site of his birthplace. Four years later, following an extended English-language biography, on October 15, 2016, a second plaque was officially unveiled by Desmond and Jacques Boutault, Mayor of Paris 2nd District, on the wall outside his former workshop, 14 rue Vivienne. The search for rare surviving examples of his instruments has become worldwide. On September 24, a Trouvé/Cadet-Picard gold skull stick pin automaton sold at Bonhams of London for $8,000. An exhibition celebrating the 180th anniversary of his birth, entitled "Gustave Trouvé, the da Vinci of the 19th Century, was scheduled in Descartes, France during the month of May 2019. ^ Ernest Henry Wakefield, History of the Electric Automobile, 540 pp, Society of Automobile Engineers, USA , 1993. ^ Desmond, "A Century of Outboard Racing", Van de Velde Maritime. 2000. ^ Publicity, « Overview of the prices of Trouvé luminous electric jewels, the sole inventor patented in France and abroad », in l’Electricité au theatre, bijoux électromobiles, 1885. ^ Overview of the prices of Trouvé luminous electric jewels, the sole inventor patented in France and abroad, in l’Electricité au theatre, bijoux électromobiles, 1885. ^ Mémoire presented by G. Trouvé, on 24 August 1891. Conserved at the Académie des Sciences, Paris, reference arch-2007/26. ^ Journal mensuel de l’Académie nationale de l’Industrie agricole manufacturière et commerciale, December, 1895. This page was last edited on 19 March 2019, at 10:07 (UTC).